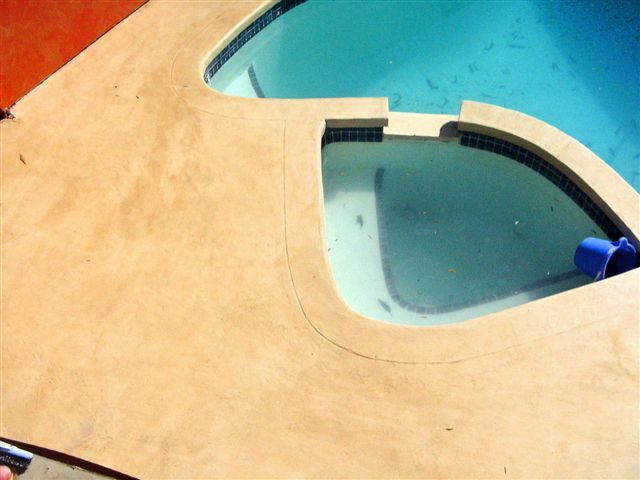 Here are some important factors to consider before you purchase any pool coatings. Information that will save you money and increase your enjoyment of your pool. Firstly, there are 2 main types of pool coatings: Chlorinated Rubber (pool paint, rubber paint) and Epoxy. Chlorinated Rubber: is a cheaper maintenance type paint which lasts 1 – 2 years before needing to be recoated. Often used in council pools which are recoated each winter. It requires an absolutely dry surface, 7 – 14 days drying, is very smelly, and is not easy to use. Not recommended, if seeking a long lasting finish. Epoxy Coatings: are more durable and come in several types. General Grade: as seen in paint shops, for use on concrete floors, workshops, steel work. These are not designed for use in swimming pools. They will be too thin and last about 3 – 5 years. Pool Grade: From specialist supplier only (not sold in shops) and will last much longer in pools as designed for water immersion 24 / 7, are chlorine, chemical and UV resistant. For these coatings all else being equal, durability relates to how thick the paint film is in your pool. As they slowly wear away the thicker the paint film the longer they last, saving you the hassle to empty and recoat your pool, before it’s due. As a guide you can expect 7 – 12 years of service life when applied correctly (Don’t spread out too far). Epotec is called a high build epoxy coating, meaning it goes on thick to give you maximum thickness and thus durability in 2 coats. All others spread out too thinly and therefore you need 3 coats to get the same thickness and the equal service life. Epotec has no thinners, but is specially designed to flow out easily by brush, roller or spray to get the thick coating your pool needs to resist wear and tear over the years. Other epoxies have thinners (up to 50%) meaning they look good when applied, but spread out too far, and are not thick enough to last. If you want them to last then you need 1 or 2 extra coats. More work for you, at the beginning or often after a few a years, when you see it wearing through. Epotec being 98% volume solids*, when applied at our specified coverage rates will provide a nominal dry film thickness of 320 microns. (About 5 times thicker than house paint) For other leading brands, the thickness is around 200 – 250 microns. (only 60 – 70% as thick). Not thick enough to last. You will need to apply 3 coats or come back after a few years and apply more. So if you are comparing epoxy coatings before deciding, make sure you are comparing the thickness of the final finish. Not just the price in the can of an epoxy with 50% thinners, which spreads out well, so well in fact, so you have not enough paint thickness there to last the distance. Hitchins Technologies operates on the basis of letting you enjoy your pool for at least 10 years and for most domestic pools 12 plus years is usually the case. See our web site for a 12 year old pool to see how it performs…..just like Epotec you can have in your pool. This is because having spent all the time cleaning and preparing the surface most home owners do not want to get back to do it all again anytime soon. We assume you are of a similar mind. Hitchins Technologies as a backup offer through Approved Applicators up to a 5 year written warranty if they do the work and follow our specifications. NO other pool coating manufacturer in Australia offers any warranty!! So they don’t back up their words. We do. Thirdly there are no short cuts with epoxies. Our Epotec is almost 100% solids, that is it has effectively no solvent or thinners. Most other Epoxies manufacturers cheapen their “in the can” price by adding thinners, often up to 50%, (thinners is cheap compared to epoxy resin) so when you put their paint onto your pool half of it evaporates into the air and though it’s cheaper to buy in the can, you end up with only 50% of the product staying behind on your pool surface. Not enough to last. It’s important you are aware that the price in the can is not what counts. What counts is how much material (thickness) remains on the surface of your pool to protect your investment. Paint companies can use hidden ways to sell you something that in the end will not last ………… it’s called dilution! Pic 1: This is what paint that’s too thin will look like after a few years. You can see the roller marks on the bottom. Epotec goes on thick, so this does not happen. Pic 2: Paint worn off on steps, leaving bare concrete showing. A high wear area that requires a thick coating if it’s to last. We trust this has been helpful. We come across this issue many times and when customers understand the ways of the industry and consider their investment and how long they want the coating to last, they agree with us. EPOTEC is the right choice. Thick not thin.